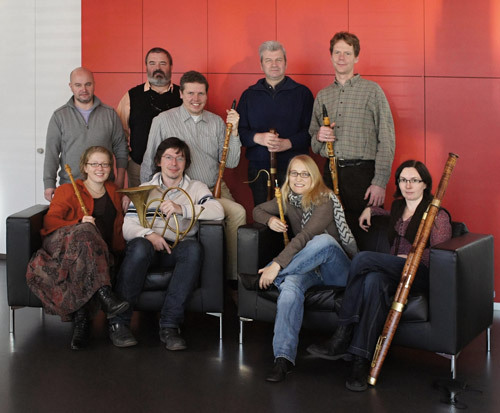 The idea to form a wind octet crystalized in 1996 when Václav Luks, then a horn player, casually asked the bassoonist Györgyi Farkas and me if we would be interested in reading through Mozart’s serenade in c-minor. He had just taken a pocket score of the work out of the library and for me, new to the oboe, a new cosmos of music suddenly opened up during that evening. We decided to form the ensemble and invite fellow students to join us, and soon nothing blocked the way for our weekly Tuesday morning rehearsals. I consider it an exceptional stroke of luck that most of the musicians of the original lineup still play together today. Our rehearsals, concerts, and CD recordings have become downright family gatherings.